Audi is a car brand synonymous with quality and German engineering. If you have an Audi car and aren't sure what are the best tyres to use, we've compiled a comprehensive tyre guide. You can use it to help you figure out the best tyres for your Audi car, depending on how you will use it. Don't compromise price or safety when it comes to tyres. Our Audi tyre guide is designed to help you get the most out of your vehicle and tyres. The Audi Supermini is a great city car thanks to its compact size. The stock tyres are sized between 185/60R15 and 225/30R19 depending on how you're going to drive the car. The smaller tyres will give you a slightly smoother ride, and help your suspension last a little longer. This extra compact version of the Audi Executive car has a lot of models. Ranging from a 3-door hatchback, to a sedan, sportback and the convertible Cabriolet model, there's a vehicle type to suit every car owner. You can select tyres especially made for high powered saloons or sportier vehicles in order to give you grip in both wet and dry conditions. 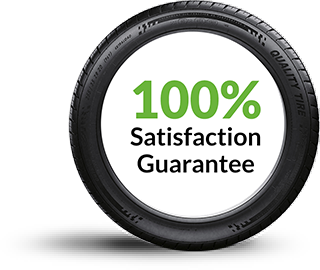 Alternatively, tyres designed for both cars and vans can give you a quiet and comfortable drive. The tyre sizes are generally sized between 195/65R15 and 235/30R20. This Audi model offers saloon, Avant and Allroad options. There's quite a big range between sizes, at 185/65R15 compared to 265/30R20. Some people with the Audi A5 Allroad crossover car may want to go with a summer tyre for sporty handling on both wet and dry surfaces. There are also super sporty options for great grip and dry traction, or options that allow for greater security and control. With this model of Audi car, you can choose from a Coupé, Sportback or Cabriolet, and choose tyres sized between 225/50R17 and 275/30R20. The latest in the line of compact executive cars, we know you want something more sporty. Your options here range from high traction tyres for safety in all conditions to high performance sports tyres designed for circuit use. Another Audi car with lots of different models, including the saloon, Avant and Allroad. The diverse range of tyre sizes sits between 195/65R15 and 295/25R22. Get a grip with high performance tuning, or choose sports performance tyres to keep a handle on your vehicle in all conditions. The tyre size for the Audi A7 ranges between 255/45R18 and 275/30R21. You may want to use your Audi Executive Sportback for city use or for great handling on all your adventures. You have the option of selecting something with super sporty handling for lots of traction and control, or you could focus on the tyre grip for great performance in dry conditions. This full size luxury saloon car is a great sedan vehicle. Choose from tyres sized between 235/60R17 and 275/35R21. It's possible to get great tread out of the tyres for made for this car, as they are built for sport handling and designed to give you lots of grip. Sport cars require excellent tyres to keep up with the power of their motor. Make sure you have quality sports tyres fitted for your Audi sports car. As a general rule, the Audi sports models will all need tyres that can give enough grip to keep you safe with the sports performance capabilities of your car. Both a sports model and a small family car, select tyres with excellent grip and tread to keep your family safe. You can choose a tyre size between 205/50R17 and 225/40R. This sporty compact executive car can be enjoyed in both the saloon and Avant models. Tyre sizes range between 245/40R18 and 255/35R19. The Renn Sport/Racing Sport model of the Audi S4 needs tyres that can handle a very high performance. If you're going to take out your Audi on a sports car circuit, ensure there is adequate grip to handle all conditions. Tyre sizes range between 235/40R19 and 255/35R18. The last in the range of compact Audi sports models, you can choose tyres between 245/40R18 and 255/35R19 for this vehicle. You can choose tyres sized 265/35R19 and 275/30R20 for this Audi RS car. These will be able to handle all sorts of curves and speeds.